A full night wedding DJ is a great option for a wedding. I play countless full night wedding DJ sets in Tipperary each year. This one from the Kilcoran Lodge shows some highlights from the night. Kilcoran Lodge is located just outside the town of Cahir in Co. Tipperary. It is a charming country house style venue that overlooks the Knockmealdown Mountains. Thy’re are many pluses for having your wedding here. Two great reasons is the fact that they only have one wedding per day and there is a dedicated wedding planner in the hotel. This means you get the full care and attention of the staff leading up to the wedding as well as the day itself. It also has some wonderful landscaped gardens to use as the backdrop for your wedding photographs. 8.30pm: Arrival & Setup: My aim is to arrive at every venue before 8.30pm. Yes, it may be a small bit early for some weddings but I always like to be on the side of caution and arrive on time. As soon as the guests finish the meal and the hotel staff have cleared the area/dance floor I will come in and setup. It, on average takes about 40 minutes to setup all of the equipment. That includes sound, light and DJ booth to hide all the nasty cables. Once that is done, I will come and chat to the couple, if I haven’t met them already. We can chat about the first dance, music and anything else I need to confirm. I usually then make an announcement that we will be starting in a few minutes. This acts as a little warning to any guest that may be outside or in a different part of the hotel to start making their way back to the function room for the first dance. 9.30-11pm: First Dance & Fun: This is the usual start time for the evening. Or usually between 9.30 & 10pm. I don’t advise starting any earlier unless you want to finish a bit earlier on the night. 4-4.5 hours of music is plenty on the night, without tiring anyone out too much. I will start by inviting all the guests up to the dance floor, forming a circle around the edges. This will take the nerves off the wedding couple as it makes them feel less alone out there. I will introduce the couple to the dance floor and leave them there on their own for around a minute. From there, I will invite the bridal party to dance floor (Bridesmaids & Groomsmen, parents if you wish). Towards the end of the song I will invite everyone on the edge of the circle to join you on the floor. The main aim is that by the end of the first dance all of the guests will have joined you on the floor. I then kick straight in with some brilliant party tunes. The first 20 mins of the night is usually some of the best. I try to keep young and old on the floor. If you have video or a photographer they will be getting these shots for the album so it’s great to have a full floor. Depending on your wishes I can cater the first half as a mix with some oldies thrown in. I often find, a lot of the older guests (Aunts & Uncles) love to dance in the first half. If needed I can cover; country, jive, waltz etc in the first half as to be sure to include everyone. I can also include parent dances if you wish (Father/Daughter, Mother/Son) during this early part of the night. You like to ask your photographer/videographer to stay for it. I normally play for about 1 hour to a 1.15 before taking a short break for tea/coffee/evening food. During this time the hotel will usually turn the lights back on and I will do some light background music while the guests enjoy the food. 11.15-2am: Party Time: Once we come from the break it is now well and truly party time. Most of the guests will have had a few drinks and will be ready to hit the dance floor. I don’t want to come back too fast so usually I will do one or two slow songs to ease into 2nd half of the nights entertainment. From there it’s party time. I can bring up the tempo of the music as the night goes on and up to what you would expect from a wedding disco. If something worked really well in the first half I can also some of that style back as needed. It is here I will be able to play a lot of the chart, 90’s and up tempo music. Or as you can see from the video I can do some of the mad 90’s dance classics (requested on this particular night). I can also include some more requests from the wedding couple as needed. I tend to mix the requests in during the night as they fit rather than just playing them one after the other. It allows for good variety that way. As well as that, if there is something particular either the Bride/Groom want I can also include it here. I often get asked for house music, alternative rock, 90’s rave tunes. These can all be included during the set in the second half. Coming close to the end I will go back to the more universal party music and get everyone back up for the last few songs. It has everyone up, all the couples family/friends and it is a brilliant way to finish off the night. Also ensuring everyone is well ready for the residents bar and the party that usually lasts late into the small hours. 2am: Say my goodbyes, pack up and go home: As mentioned above, I will always finish on a high note and with a “one more tune”. This can really be anything. Sometimes it is requested by the wedding couple to finish on a particular song or most of the time it is left up to me. From the 4 hours you will have had me I will get to know the guests and what they like. I will either finish on a really up beat song or maybe a slower song that everyone can sing along to. Sometimes I even have both styles cued up and ask for a shout from the guests as to which one they would like. This works especially well at Christmas where I have a festive song and sing a long both cued up. I ask would they like me to finish on either one. The song that gets the loudest shout wins! Once my job is done I will of course again, congratulate everyone. Thank them for a great night and begin to take all the gear down. From there I load the van and start the trip back home. 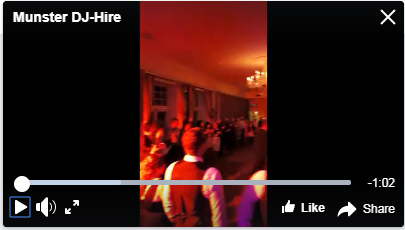 The few clips below (apologies on the orientation) are from a Kilcoran Lodge full night wedding DJ in Tipperary I did in the Winter time of 2017. It was a great night from start to finish and the clips are just a few highlights from the night. Enjoy. Wedding DJ in Clare – Paudie Walsh @ The Armada Hotel, Spanish Pt.